Many websites nag us to let them send us notifications whenever they imagine they might have something we might want displayed. We call these Push notifications because they push their notifications into our computers. You can allow or disallow these one at a time if you like, but if you want to stop all sites from even asking, here's how. The main menu will appear. Click on Options. In Options, click on Privacy & security on the left. On the right, go to Permissions. Permissions is two-thirds of the way down the section. 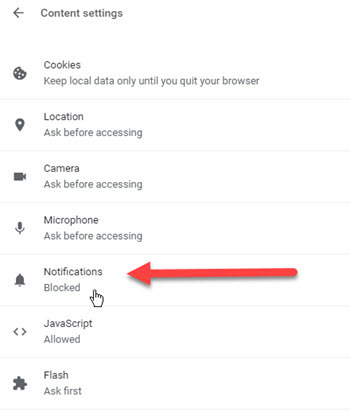 Click on the Settings button next to Notifications. 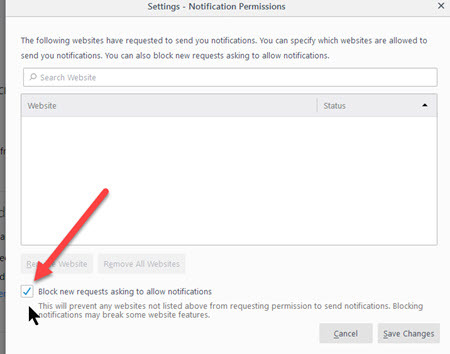 Check the Block new requests…"
If you want notifications from some sites, you'll want to allow those before turning off future requests.